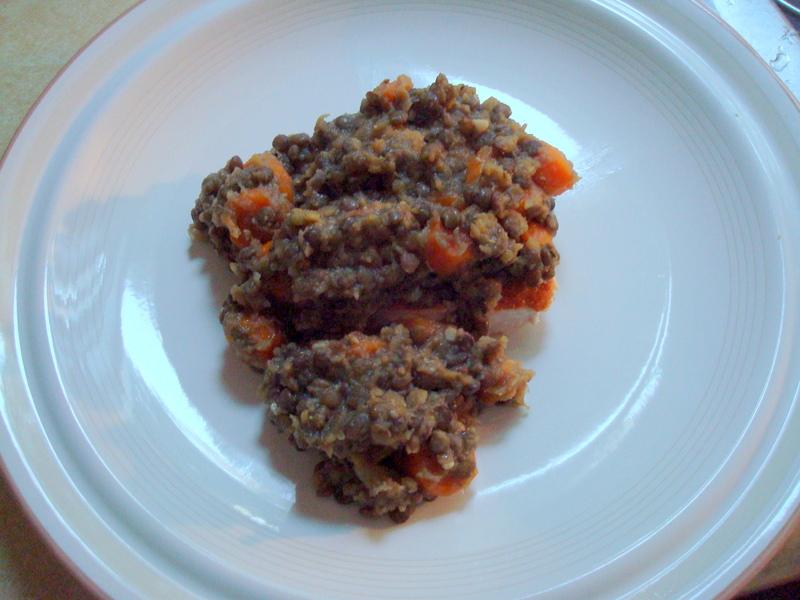 The healthy meal starts with lentils and you all know how I feel about lentils. Delicious! 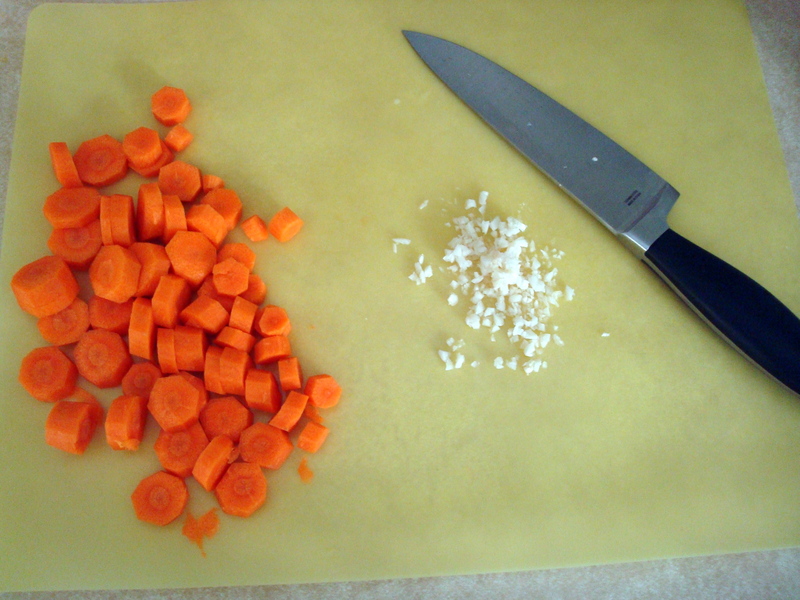 Then you add some carrots, garlic, and onions. Sounds good so far! While that was cooking I got started on a favorite side dish of mine that I learned from a friend who made it for a dinner she hosted years ago. 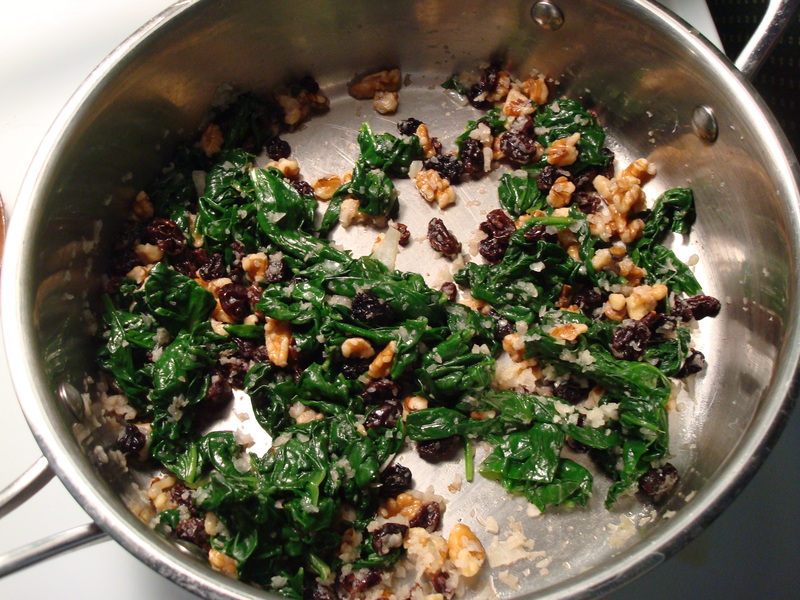 It involves spinach, raisins, pine nuts (I did not have any on-hand so substituted walnuts) and onions. It’s tasty and healthy! The combination is savory, sweet, salty, crunchy, and overall packed with things that are good for you. I love it when things that are good for you actually taste good too! Back to the lentil dish… it also involves pan-grilled salmon but this morning I realized that I did not get a photo of the actual salmon. Oops. The salmon is in the picture below but you can’t tell because I buried it with the cooked lentils and it turns out I was supposed to put the salmon on top of a bed of lentils. I’m not running a restaurant here, people– it doesn’t always look pretty. But it tasted pretty darn good and it almost makes me feel less bad about the chicken fingers, sweet potato fries, and custard/cookie dough concoction that I ate last night. Almost. 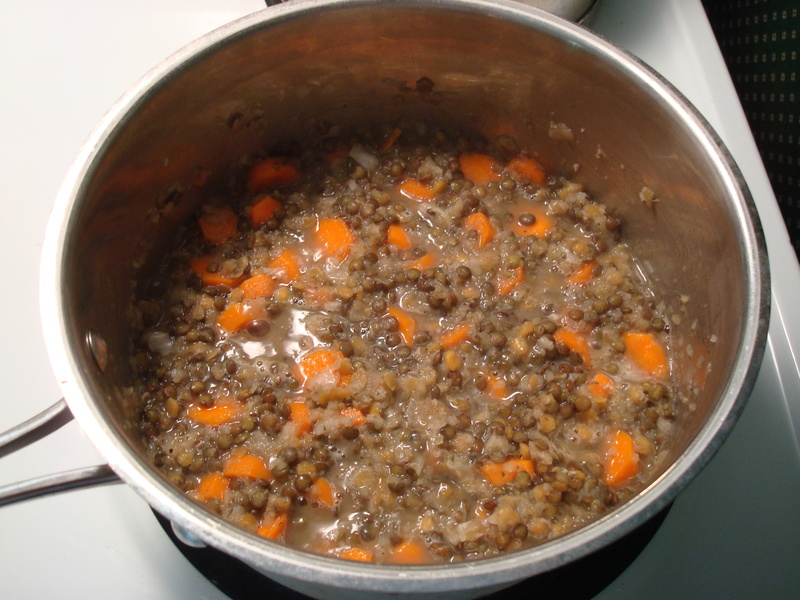 Place lentils in a large, deep saucepan with water to cover. Cook over medium heat, stirring occasionally, until they begin to soften, 15 to 20 minutes, then add the carrots, onion, garlic, and herbs. 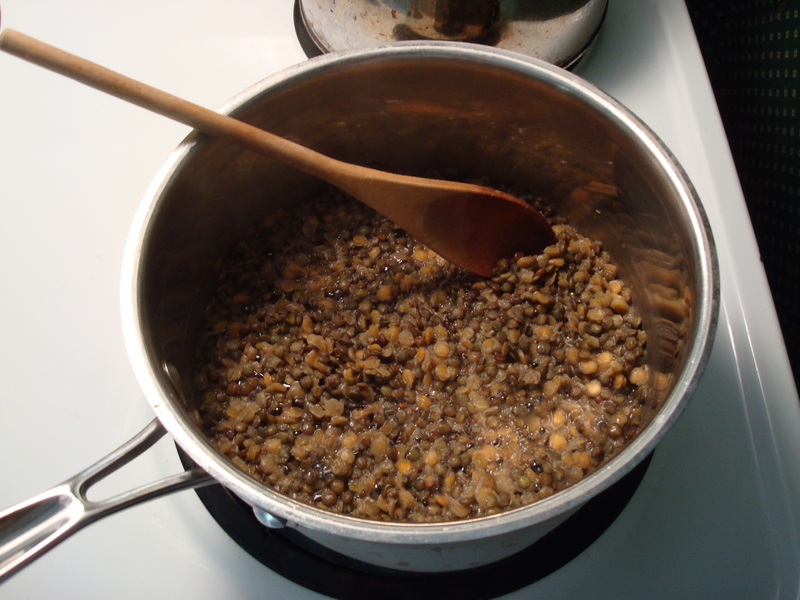 Continue to cook, adding water if necessary (keep this to a minimum), until lentils and vegetables are tender, 30 to 40 minutes total. Season with salt and pepper, add the olive oil, and keep warm. 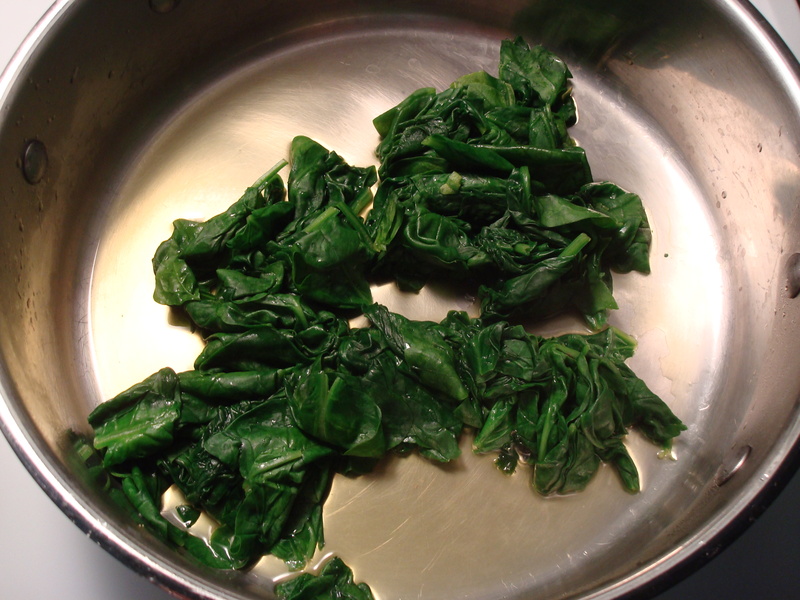 Rinse the spinach well and remove the stems. Place in a large sauté pan with only the rinsing water clinging to the leaves. Cook over medium heat, turning as needed until wilted, just a few minutes. Drain well and set aside. Add the olive oil to the now-empty pan and place over medium heat. Add the onions and sauté until tender, about 8 minutes. Add the spinach, raisins, and pine nuts and sauté briefly to warm through. Season with salt and pepper and serve warm or at room temperature. This looks like a really good recipe and since your Uncle Denny just caught a 19 lb. salmon out of Lake Michigan it is a good reason to cook this up. Thanks Kirstin, your are doing a fantastic job with this blog! This looks really really good! I’m going to try the spinich this weekend.